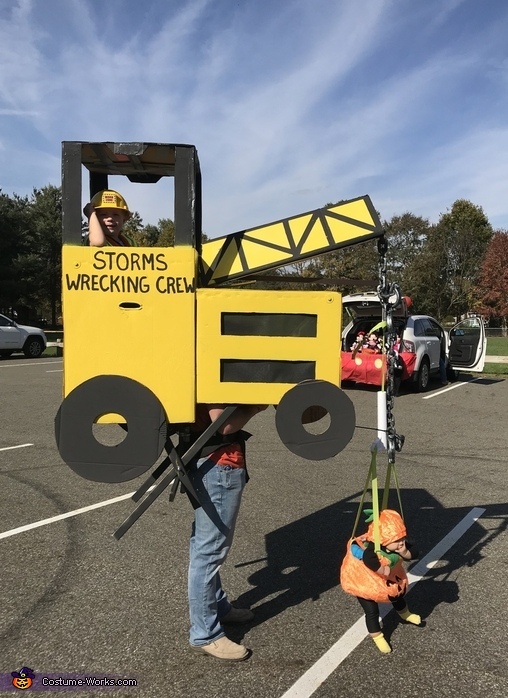 My husband Adam is the glue that holds this costume together, our son Bode is in the crane, and our daughter Savannah is the wrecking ball pumpkin. Two years ago, we used the frame of this costume to make our son a Paratrooper to take after his Army dad. This year, we wanted to incorporate our daughter into the costume. Our son loves trucks and diggers and he was all for his sister being the wrecking ball, so we decided on making a crane and a wrecking "pumpkin." Their daddy loved this costume the most!